I guess the theory behind this would be that players scoring important goals and having a higher impact on games should perform better at a draw game state or a negative one. Looking at this also of course could indicate that certain players just play more time in certain game-states. The later leaves for an improvement, measuring time spent in game states! One player here interesting to look at and easy to find is the top scorer in Allsvenskan, Emir Kujovic. He has 3 goals for 2 XG at a trailing game-state, 6.7 XG and 8 goals at draw game states and 6 goals for 7.2 XG at a leading game-state. This could actually say that the goals he makes tend to be more important end definitely contributing more to the outcome of games! The player who may stand out most in a negative way is Markus Rosenberg. 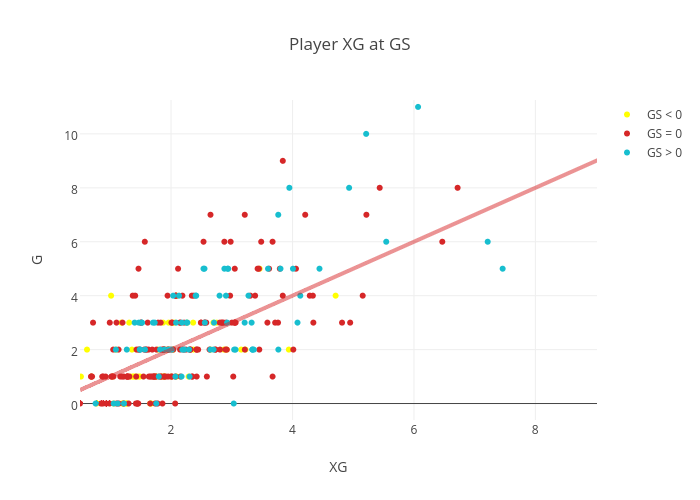 He has very negative G-XG at all game-states! 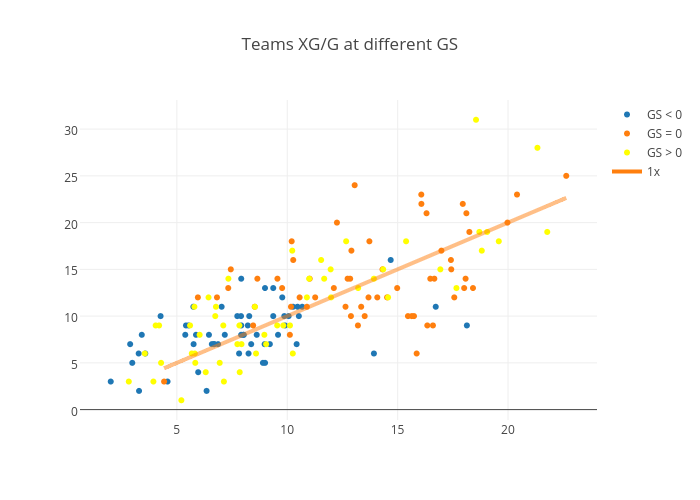 In the next plot I have summed the XGs up for every team instead. Örebro really stands out. Especially in negative game-states. They have scored just 6 goals for an expected 13,9 making that a big explanation for why they have been struggling this season in the bottom of the table. Their G-XG however is probably increasing right now as they have started winning some games. On the other end Jönköping Södras 24 goals for 13 Expected ad the draw game-state is impressive. And they will also probably secure their promotion to Allsvenskan the next round. Previous Previous post: The (true) importance of scoring the first goal.